Congratulations to Dr. Wehrman, who has been invited to speak at the “Spirit of Inquiry in the Age of Jefferson Symposium” at the American Philosophical Society in June, and to the “GameChangers Ideas Festival” in North Dakota in October. Both these events are open to public and registration is open. From the American Philosophical Society website: “In commemoration of the 275th anniversary of the American Philosophical Society’s founding in 1743 and the birth of its long-time President, Thomas Jefferson (1743-1826, APS 1780, President 1797-1814), the APS Library, along with the National Constitution Center and the Robert H. Smith International Center for Jefferson Studies at Monticello, are organizing a daylong symposium that aims to explore the history of science, knowledge production, and learning during the Age of Jefferson (1743-1826).” For the full program of the event, click here. BLACKBURN LECTURE: Edward Ayers, "Civil War and Emancipation in the Heart of America"
Next week! Join us for the George M. Blackburn Endowed Lecture on the Civil War and Reconstruction by Dr. Edward Ayers, who will present "Civil War and Emancipation in the Heart of America" on Friday, April 20 at 7:30 pm in the Park Library Auditorium. Open to all. Our students will exhibit their research at the 25th Annual Student Research & Creative Endeavors Exhibition tomorrow Wednesday, April 11 from 1:00 pm until 4:00 pm in Finch Field House. The exhibition is open to all. We hope you will join us to discover the latest research and meet our students! Primary Author: David Banas Jr.
Hugo Zayas' dissertation defense, "Makers of Knowledge: Seventeenth-Century Jesuit Intellectual Culture in the Spanish World"
2018 International Graduate Historical Studies Conference; Alan Taylor, "Transforming North America: Empires and Republics in War and Peace, 1800-1850"
Join us for the 2018 International Graduate Historical Studies Conference "Real and Imagined Borders: People, Place, Time." The conference is hosted by the Department of History and will take place on April 6-7 in the Bovee University Center. 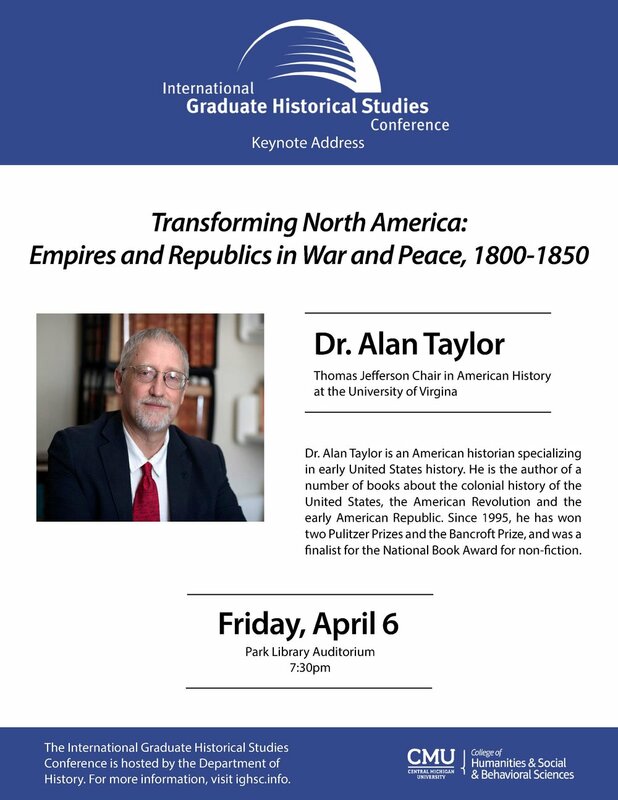 Dr. Alan Taylor will give the keynote address "Transforming North America: Empires and Republics in War and Peace, 1800-1850" on Friday, April 6 at 7:30pm in the Park Library Auditorium. A reception will follow the talk. Dr. Alan Taylor is the Thomas Jefferson Chair in American History at the University of Virginia. He specializes in early United States history, and he is the author of a number of books about the colonial history of the United States, the American Revolution, and the early American Republic. Since 1995, he has won two Pulitzer Prizes and the Bancroft Prize, and was a finalist for the National Book Award for non-fiction. Hendrik Meijer, co-chairman and CEO of Meijer, Inc. and author of Arthur Vandenberg: The Man in the Middle of the American Century (University of Chicago Press, 2017), will give a talk about the book — on the writing of which which he has also written a post for this blog — on Monday, March 19 at 7pm in the Park Library Auditorium. A reception will follow the talk. Longtime NPR correspondent Cokie Roberts writes of Meijer’s work, “every member of Congress should read this book.” Join us to discover why. 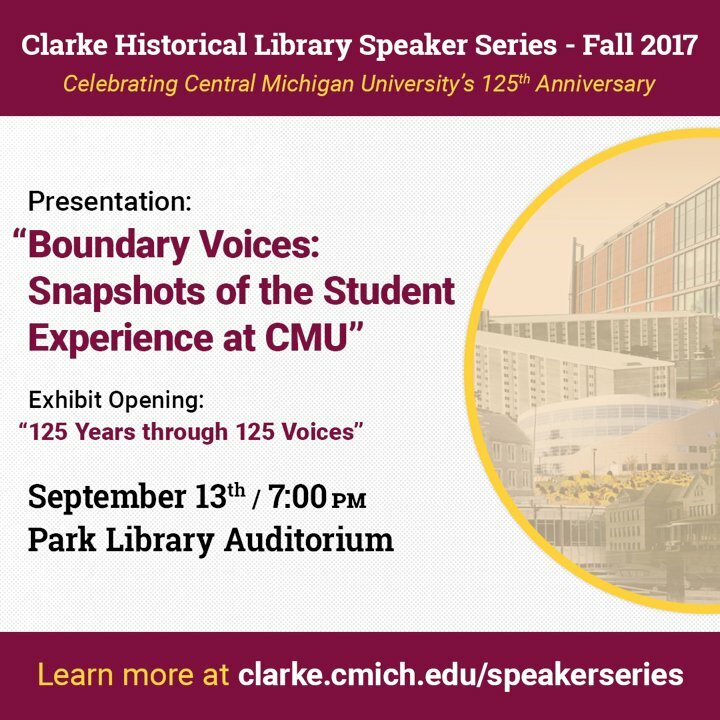 This presentation is co-sponsored by the Clarke Historical Library and the Critical Engagements initiative of the College of Humanities and Social and Behavioral Sciences at Central Michigan University. Dr. Steven Gold, Professor of Sociology at Michigan State University, will give a talk entitled “Undocumented Immigrants and Self-Employment in the Informal Economy” on Thursday, March 22 at 4:30pm in the Park Library Auditorium. Dr. Michelle Cassidy presented on the involvement of Native Americans from the Odawa and Ojibwa tribes during the U.S. Civil War. On February 10, during the celebration of the Isabella County 159th Founder's day, CMU History professor Michelle Cassidy gave a presentation on the involvement of Native Americans from the Odawa and Ojibwa tribes during the U.S. Civil War. "Founded in 1863, the Union-aligned Company K had approximately 136 Anishinaabe members, mostly from the Odawa and Ojibwa tribes; a total of approximately 20,000 Native American men fought for the Union and Confederate armies combined. Specifically, about 27 men in Company K came from Isabella County, Cassidy said." 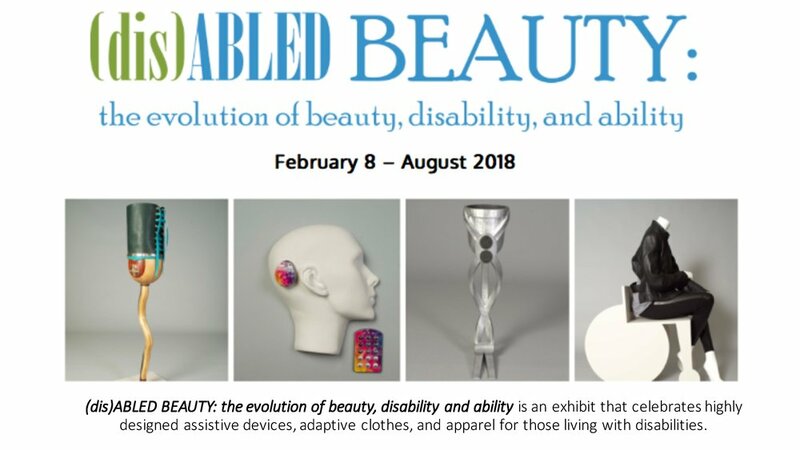 I would like to invite you to the exhibit opening of (dis)ABLED BEAUTY: the evolution of beauty, disability, and ability on Thursday, February 8, 2018. The exhibit is hosted by the Clarke Historical Library and features student and faculty work from the Department of History in the College of Humanities and Social and Behavioral Sciences. The exhibit is a celebration of highly designed assistive devices, adaptive devices, and apparel for those living with disabilities. A companion to the exhibition, The (dis)ABLED BEAUTY Oral History Project places the experiences and perceptions of people with disabilities at the center of this exhibition. Dr. Brittany Fremion (History), Dr. Stacey Lim (Audiology), Adam Strom (Due South Productions), and advanced undergraduate and graduate students enrolled in HST 585: Oral History in fall 2017 gathered over 15 hours of interviews, preserved in the research collection of the Museum of Cultural and Natural History at CMU. Portions of individual stories are featured in the exhibition to weave together a narrative that explores the history, perception, and experience of disability. 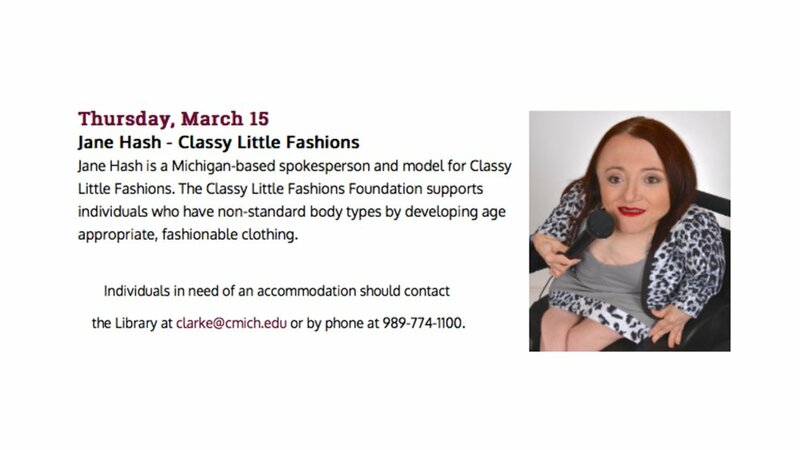 The stories of current and former CMU students, faculty and staff, as well as those from individuals engaged in Disability fashion, activism, and adaptive sports, help to make clear that there is no singular disability or experience. 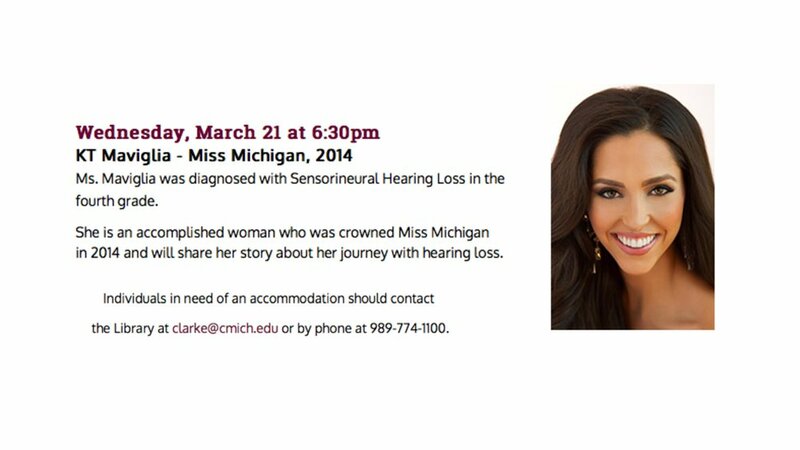 The evening's festivities will begin with a guest speaker at 7:00 pm in the Park Library Auditorium. Guest speaker, Heidi McKenize, was in an accident that left her paralyzed from the chest down and subsequently went on to found, Alter Ur Ego, a clothing company for wheelchair users. Following the guest speaker, Alexis Jones will be presenting her American Association of Textile Chemists and Colorists (AATCC) award winning designs for children with autism. In collaboration with the exhibit, Fashion Merchandising and Design students worked on surface designing prosthetic legs (that were graciously donated by Springer Prosthetic & Orthotic Services) and submitted their work to a juried competition sponsored by Threads Fashion show and Michigan State University's department of Physical Medicine and Rehabilitation. The student's designs will be on display at the library for the exhibit. Awards will be distributed to 1st, 2nd, and 3rd place winners along with a viewer's choice award following the guest speaker. Then, at 8:00 pm, guests are invited to tour the grand opening of the (dis)ABLED BEAUTY exhibit. Hors d'oeuvres and wine will be served. I hope that you will be able to attend and celebrate the evening with us. If you have any questions, please let me know. 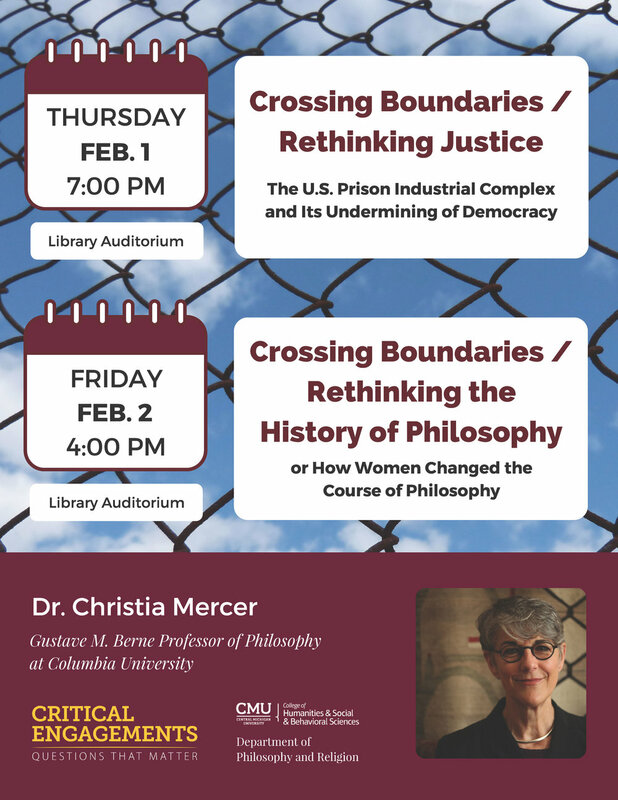 As part of the Critical Engagements initiative at CHSBS (“People On the Move: Borders, Boundaries, and Migration”), the Department of Philosophy and Religion is hosting two talks by Christia Mercer, Gustave M. Berne Professor of Philosophy at Columbia University, on February 1 and 2. Dr. Mercer’s scholarly work has focused on understanding the role of women in the history of philosophy, including a forthcoming book on the philosophy of the seventeenth-century English philosopher, Anne Conway. She was the first professor to teach in Columbia University’s Justice-in-Education Initiative, which offers courses to incarcerated and formerly incarcerated people. The Department of History is glad to welcome Marc Kleijwegt, Professor of History at the University of Wisconsin-Madison. On Thursday, January 18, at 5pm, Professor Kleijwegt will give a talk on “Documenting Slavery in Comparative Perspective: Evidence from the Ancient and the Transatlantic World.” Sponsored by the Department of History and featured as a part of the Critical Engagements series of the College of Humanities and Social and Behavioral Sciences, this is the sort of talk that features documents in context, including the ones provided in advance by Professor Kleijwegt. Gregory Smith, chair of the Department of History, and Christi Brookes, chair of the world languages and cultures department, have launched the Criticial Engagements initiative at CMU to foster dialogue and learning around questions that matter. "The idea is to come together as a community of people pursuing all sorts of projects, research and teaching, and realizing how all of those can fit around a common theme and address today's most difficult issues," Smith said. "There comes a point when you realize we're all working on pieces of the same problem, from different but related perspectives. You realize we really are One CMU." Over the course of the academic year, students, faculty, staff and residents will be able to participate in classroom conversations, projects, research, and special events around the theme "People on the Move: Borders, Boundaries and Migration." The first Critical Engagements keynote event this fall is a presentation by Marcello Di Cintio on Thursday, Nov. 16 at 7 pm in the Powers Ballroom. Di Cintio is a Canadian journalist who has traveled and lived along disputed borders in many parts of the world. As noted in his biography, Di Cintio's "last project was a book about walls, fences and other ‘hard’ barriers – and the people who live in their shadows – called Walls; Travels Along the Barricades. For this book, [he] visited walls and fences in Algeria, Morocco, the Spanish enclaves of Ceuta and Melilla, Israel, Palestine, India, Cyprus, Montreal, Belfast and along the US-Mexico border. Walls won the 2013 Shaughnessy Cohen Prize for Political Writing, among a few other awards, and has been published in Canada, the US, the UK and Bulgaria." 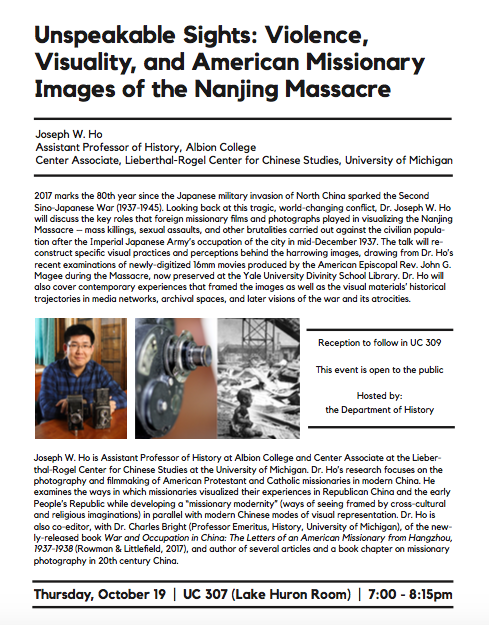 The presentation on Nov. 16 is free and open to the public. The Department of History is looking forward to some exceptional speakers this coming year. Mark your calendars now so you don't miss the opportunity to hear from these renowned historians. Follow the blog for reminders and updated information as the dates approach. For the William T. Bulger Lecture Series on American Biography, we are pleased to welcome Susan Ware on Nov. 2, 2017. Ware is the Honorary Women’s Suffrage Centennial Historian of the Schlesinger Library at the Radcliffe Institute for Advanced Study and a leading biographer of feminists. Her book on Amelia Earhart was the first to place the female pilot into our understanding of the advancement of feminism: Still Missing: Amelia Earhart and the Search for Modern Feminism (W.W. Norton, 1993). Her most recent monograph is Game, Set, Match: Billie Jean King and the Revolution in Women's Sports (University of North Carolina Press, 2011). For the George M. Blackburn Lecture Series on American Civil War and Reconstruction History, we are honored to have Edward Ayers present "Civil War and Emancipation in the Heart of America." The lecture will take place on Feb. 16, 2018 at 7:30 pm in the Park Library auditorium. Ayers is the Tucker-Boatwright Professor of the Humanities at the University of Richmond, where he is President Emeritus. In 2013, he was awarded the National Humanities Medal by President Barack Obama. He is an accomplished historian of the American South. His book The Promise of the New South: Life After Reconstruction was a finalist for both the National Book Award and the Pulitzer Prize. 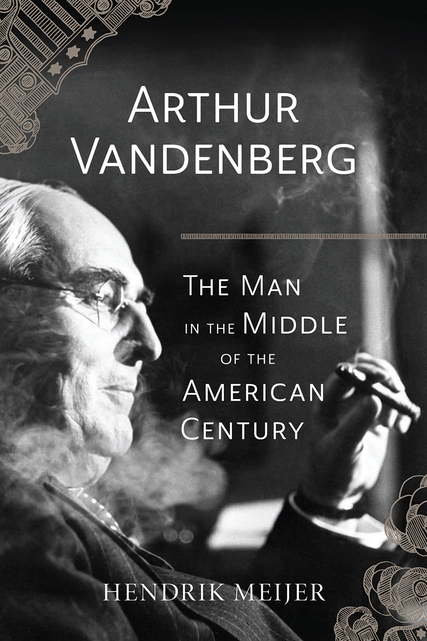 In the Presence of Mine Enemies: Civil War in the Heart of America won the Bancroft Prize for distinguished writing in American history and the Beveridge Prize for the best book in English on the history of the Americas since 1492. For grad students, Ayers will also run a workshop on digital history called History Between the Lines. The workshop will take place 12:30-2:00 pm. 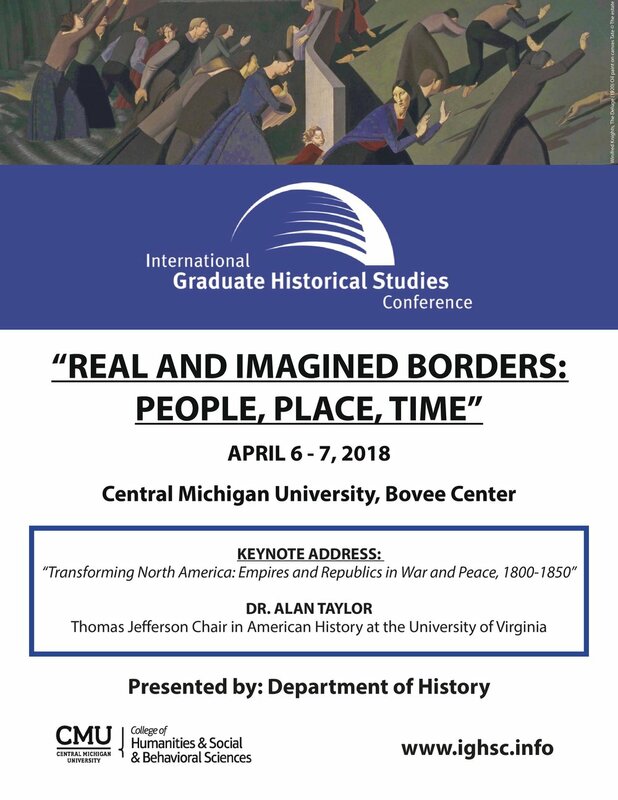 For the International Graduate Historical Studies Conference Keynote Address, we are pleased to have Alan Taylor present "Transforming North America: Empires and Republics in War and Peace, 1800-1850 on April 6, 2018. Taylor, a historian of colonial and early republic America, holds the Thomas Jefferson Chair in American History at the University of Virginia. Taylor has received many awards and prizes for his work including the Pulitzer Prize for American History for his book The Internal Enemy: Slavery and War in Virginia, 1772-1832 (W. W. Norton, 2013). His most recent monograph is American Revolutions: A Continental History, 1750-1804 (W. W. Norton, 2016). Martin Farr of Newcastle University will offer a presentation on Brexit and the General Election of 2017. British PM Theresa May just called for an election, so Farr is sure to offer interesting insight for us on this tumultuous period of British politics. Join us in Powers Hall 121, Monday, April 24, 12-1:30 pm.